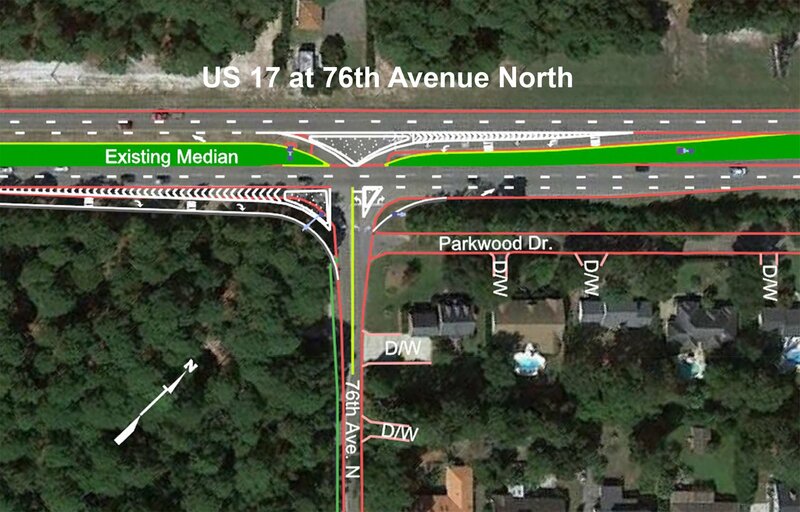 SCDOT is ready to begin work on the improvements shown in the attached illustration at the intersection of US 17 and 76th Avenue North. This project was originally proposed in 2015 due to wrecks occurring at this location. The extra turning lanes and visibility are designed for safety. Offsetting the current right turn lane onto 76th Avenue North to improve visibility. Building a southbound accelleration lane on US 17 for merging traffic. Building concrete islands to help direct traffic movements. Construction is expected to begin in about two weeks and will include nighttime work, due to necessary lane closures on US 17. No detours will be required, but flaggers may be present at times. Road construstion signs already have been installed in the area, but are bagged until the work begins. Questions? Call SCDOT's Conway office at 843-365-2130.